I can't believe I am the first one to post. Beautiful cards. I think my favorite is Lovin' From the Oven. OH, this is my other favorite set!! I also really like the Oriental Gardens. Thanks so much for the chance to win it!! I LOVE IT!!! So cute!! I think my favorite is The Botz Family. I just love those robots! Love your cards. Ok I love this set and always need help with manly man and little manly man cards, so this would be perfect. Thanks for a chance. This is so cute! But my favorite is Whispy Blooms! Your creations are great! Thanks for the chance to win!! I have blogcandy every wednesday if you are interested! I love Drake the Dragon! I love Pat the Bad Dog. But your Lovin from the Oven card is cute. I like that set as well!!! Woo hoo! I just ordered two of the stamp sets. My favorite is the dragon one. Holy cow! Another absolutely adorable set!! Love your cards!! So far, my fave set I think is Pat the Bad Dog but I love 'em all!! I love this set. TFS!! I love drake the dragon, but i also love this set too. Reminds me of my little man. Thanks so much for sharing. I must have Oriental Gardens! Cute cards! I would have to say my favorite new set is Granny's Support Team. Love the sentiments! Love your cards! I think my favorite has to be Pea-Nut Bunny!! oh my goodness! this set is SO cute! I love the oriental gardens set, but this is a close second! Your cards are very cute. This stamp is in my list of the six I like the most. I chose Hello Spring as my favorite, most likely because I am tired of Winter. Thank you for an opportunity to win a new stamp set. My fave is Drake the Dragon but this set is cute too! Perfect for my little boys. How cute! Put my name in the hat please!! Whispy Blooms has to be a fav for me!! Great cards. of the sets already released, Bubs the Beaver is my favourite, but I think of the new sets, the St. Patty's day set that Marianne is featuring is my favourite. So sweet! My fav is Kit the Kat! thanks for the chance to win! Boy cards are so hard to do but this set would make it soooo easy. Absolutely adorable samples! Enter me please! Love your card....the colors are great. My fav is whispy blooms...among alot of others...hard to choose just one. This boyz set certainly caught my attention, but my fav has to be drake the dragon! My 5 y/o DS would love him! Cute cards!! OMGosh, this one will be a must have. There are so many great sets, it is hard to choose, but I guess for now Growing Gratitude is on the top of my wish list....something about flowers! My favorite is Hello Spring, but this one would also be great for me. I LOVE LOVE LOVE OCL... so much so that I have convinced the store owner where I work to bring them in!!! those cards are freakin cute! OMG! I love the star sets, of course I have a girl, if I had a son, this might be my fave! Your cards are adorable!! Love this set! My favorite is Pea-Nut Bunny. My favorite is Bear-ly Fishing. Thanks for the chance to win! I really like Oriental Gardens, Star's Slumber Party and Lovin' from the Oven. It's impossible to choose just one. Love all the sets, but Kit the Kat is my favorite! Thanks for the chance to win! This is my favorite set! I can't wait to get it and use it for cards and scrapping for my lil guy! Love this set I could use it for my son scrapbook pages I love granny but this is to cute. Snail Mail is my favorite but thats only if we have to choose you know we actually love them all. Very cute boys stamp set. Beautiful cards. this is one fab stamp set - perfect for the boys (and even the men) in our lives!! I love the way you made your own sentiment!! My favourite set though - that has to be Flowers for You - let me get my hands on that versatility! My fav is Hoppy Anna Mae but Pat the Bad Dog is a close second! Those boys are so cute definitely my 2nd fave but my first is Children of the World. I really like this set. I'm always saying I need a set for a boy. Snail Mail is still winning out with me, but I've you ladies have done such a great job showing off all the new sets, it's a hard choice. Who can pick one favorite?!?!? I like Pat the Bad Dog, Pat the Dawg House, and Lovin' From the Oven. Thanks for the chance to win a cute boy set. Cute card! My favorite is Hello Spring. You outdid yourself with all these great cards!!! I love these little boys. My favorite set is Snail Mail. Thanks for the chance to win. I like your verse" Boy: a noise with dirt on it!" Too cute. My fav set is Granny's Support. Loved the way you used the scrabble letters..so cute! My favorite is Pat the Bad Dog...but they're all so cute!! There are lots of fun sets from OCL, and my favorite from CHA is Whispy Blooms. It's totally cute! What a great group of new stamps! I love your cards, they are so fun & cute. My favorite is Kit the Kat because I love kitties. Thanks for the chance to win. What cute boy cards...I really need a boy set. I like the set Lovin from the Oven...Thanks so much for the chance to win. Very cute!! My favorite so far is Snail mail. I love this set. However, I would have to say Pat the Bad Dog is my favorite. These are all so cute it is hard to have a favorite, but I really like Star Rocks the best! I love the Botz set as well as Dr Peanut. These cards are too cute. Thanks for the chance to win! I LOVE, LOVE, LOVE this se. It is my favorite of the new releases. Those boys are so adorable. I see lots of use of this set in my scrapbook for my son. I love all of the sets but the ones that speak to me are oriental garden and children of the world. My vote is Drake the Dragon! Very cute boy cards!! My fave is whispy blooms! This is a great set, but still think lovin' from the oven is my fave. I need a set to make boy cards - your samples are precious! my favorite set is Oriental gardens. OH I absolutely love the Bear-ly fishing and Just Bugz! Those little guys are just so cute. Great set and I love the sentiment on the first one. I think my favorite set so far is lovin' from the oven. Oh oh oh!! So cute! I love the colors you've used together. I have been waiting so long for cute boy stamps!! Haven't seen all of the sets yet so not sure which I will choose as my favorite but so far like all the sets I've seen. Your card creations are FANTASTIC! But my fav stamp set is Pat the Bad Dog. I'm having so much fun blog-hopping and making friends this year. I like the oriental garden and the naughty dog. Thanks for such a generous giveaway! I hope I'm chosen as the lucky winner!! Cute, cute set!! I think my fave is Pat the Dog. LOVE your header! I have two boys and 3 nephews, so this would be a perfect stamp to win. Cute set. My favorite set, however, is "Hello Spring." Thanks for the chance to win. This is my favorite set. The Boys Toys set is just so cute. 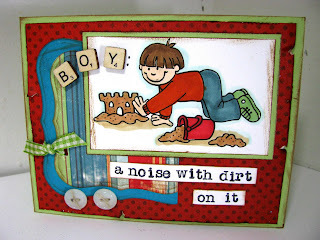 These are adorable cards and yes, a boy is noise with dirt on it!! lol This is going to be one of my faves! Cute set. Thanks for the opportunity to win. What a fun set. My favorite is Hoppy Anna Mae but, this one is super cute for little boys. Thanks for a chance to win. I like the cards you made with this set. Thanks for sharing it with us. Great cards and I love 'the boys' but Pat the Bad Dog is my favorite. Thanks for the chance to win. Your cards are fabulous! This is such a cute set! My top 2 sets (it is s tie) are Star's Slumber Party and Ducky Days. I can not make up my mind I am loving them all! Wow! Another cute set! My favorite is Flowers for You. What a great set! I need some boy stamps!! my favorite is Oriental Garden! I just love all the sets, they are just too cute to pick just one! I like Whispy Blooms best though. Very cute cards! No little boy here, but my favorite set in the release is Oriental Garden! Kit the Kat or Pat the bad dog are favourites though love the baking, tooth fairy, bunny and so forth ones-I could go on and on! Very cute set and I now have 2 boys so it would be perfect! Awesome samples too! This set is adorable. I love your samples!!! My favorite is Irish Blessing. Thanks so much for sharing. This is a great set and you did an awesome job on your cards. You ladies are so talented! My favorite so far is whispy blooms. My favorite set is Just Bugz. It's fun, happy and whimsical. I don't own any sets from OCL yet and would love the chance to start my collection. Thanks so much! I love Pat the Bad Dog!!! Great cards! Would love to win! Great set. With two boys I could use this set a lot. I also love Pat the Bad Dog. Great cards and thanks for the chance to win this set. I have to say Pat the Dog is such a cute set but I still an having a hard time picking a favorite. All of these sets are so cute. How can we choose? Thank you for sharing the chance to win! Cute card. To chose one set - hmmmmm man, I like several! Pat the Bad Dog is cute. The new baking set is great. My birthday is St. Patrick's Day so those sets would come in hand. But, something about Grandma's Support Team just cracked me up! My new favorite stamp set is Whispy Bloom. I like this Boys Toys, it would be great for making boys birthday cards. These are awesome kid cards! I think my fav new set is Granny's Support Team - LOL! Thanks for the chance to win! I think I like Growing Thanks, the one with the flowers and the watering can. There are so many to choose from! Your cards are adorable!! It's a toss up between Tooth Fairy and Boys Toys. 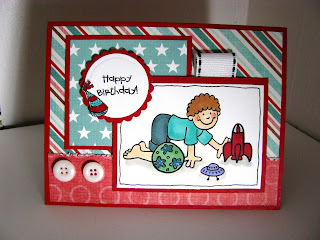 Your samples are simply adorable and I have such a hard time creating boys birthday cards! My favorite is Bear-ly Fishing. I like the flowers and ladybug set. awww..boy toys is sooooooo cute! I actually like them all and if u pick me I would love to have any set ! CHER tyvm! Finally, stamps for a little boy. My little grandson is so hard to make cards for, as there aren't very many out there for boys. I love this set, and Granny’s Support Team! I like Drake the Dragon. Really love your cards ! The stamp set is great. I love this kit! Very cute! I have two boys so this is one of my favorite sets along with snail mail. Thanks for the chance to win! my favorite is the robot set but i loved the cards you showed us on your blog so adorable. I love what you have done with this set. This is such a cute set! My favorite is Hoppy Anna Mae, though! nice job, love the cards!